The Cobray Mac 11/9 competes with the Tec 9 series of pistols as the scariest looking gun that dominated the Miami Vice era. 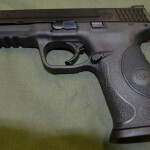 The Mac is a gun that will turn heads at the range. 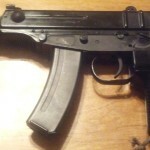 It resembles the famous Mac machine pistol in almost every way except it doesn’t have a collapsible stock. 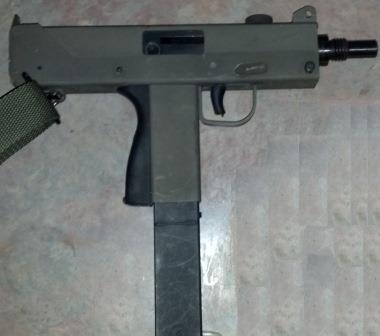 The Mac 11/9 is a 9mm semi-automatic pistol that just so happens to resemble a famous sub machine gun. The gun is huge, and it’s heavy. 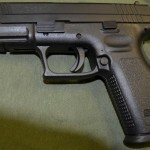 9mm isn’t a heavy recoiling round, and that mixed with this weapon’s weight means the gun produces very little recoil. The gun is the perfect range toy. As a self-defense weapon it’s just way too bulky and heavy to carry. But home defense? Sure. It’s quite unwieldy and the sights are very crude and difficult to use. Also the bolt moving back and forth in this huge weapon does not help accuracy. Also, the grip is big and pretty uncomfortable to hold. So what’s redeemable about this gun? Its sheer fun value. It’s a fun gun – perfect to hit soda cans, but not to produce tight groupings. 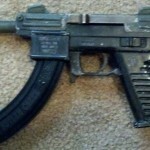 Throw in a 32 round magazine, attach a barrel extension, and let loose with it. 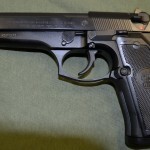 The weapon is surprisingly reliable and this shooter has rarely experienced any kind of failure to fire or failure to eject. 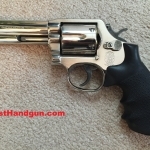 This is the perfect gun to play bad guy – at the range of course!